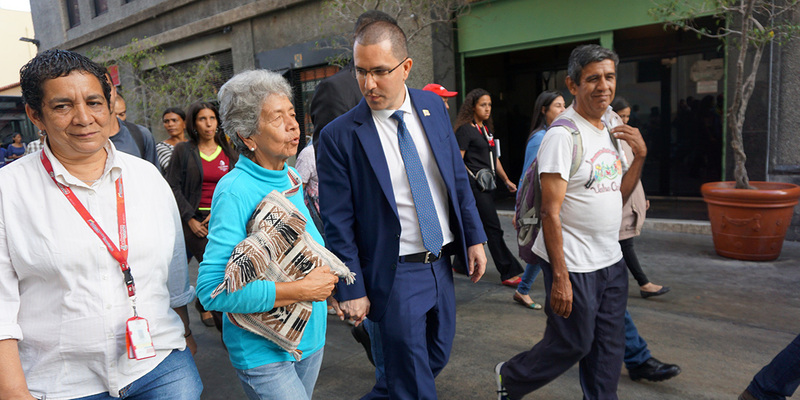 On Thursday, the People’s Power Minister for Foreign Relations of the Bolivarian Republic of Venezuela, Jorge Arreaza, invited the Venezuelan people and the world to join rationality, to avoid aggression against Venezuela and to respect the principles emanating from the Charter of the United Nations. “That the values ​​and principles of the Charter of the United Nations be respected (…) I hope that a fulminating ray of light illuminates the people of the United States to avoid an even worse aggression against Venezuela”, said the Venezuelan Foreign Minister from Plaza Bolívar in Caracas, after signing the letter of peace, a public letter sent by President Nicolás Maduro to the entire American people. In this context, Arreaza maintained that the character of the National Government has been the permanent dialogue and hence the support that President Nicolás Maduro made to the Dialogue Mechanism in Montevideo, promoted by the governments of Mexico, Uruguay and Bolivia, as well as the 14 members of the Community of Caribbean States (Caricom), to promote and facilitate understanding with the opposition sector. He also said that “we are people of dialogue (…) I call the Venezuelan opposition to think about the Homeland, in the future of Venezuela (…) it is enough to put yourself at the foot of the United States”, he said. “For the future of the Homeland, for our children, we have to create many shields to avoid intervention in Venezuela (…) we have to do whatever is necessary so they do not take our independence away” the Venezuelan diplomat exhorted. The Head of the Foreign Ministry, indicated that “it is a time for the Homeland, for national unity (…) to defend the sacred soil of Venezuela that can not be damaged”. In that sense, he added “this is an open letter to the United States, so they know that here there is a dignified, sovereign people who want to live quietly without any interference”.